Abidjan, December 20, 2018 - The Minister of Petroleum, Energy and Renewable Energies, Mr Abdourahmane Cissé, the Minister of Economy and Finance, Mr Adama Koné, the Secretary of State to the Prime Minister in charge of the Budget and State Portfolio, Mr Moussa Sanogo, and the Director General of Atinkou, Bernard N'Guessan Kouassi, in the presence of the Managing Director of the Eranove Group, Mr Marc Albérola, have signed on Wednesday 19 December 2018, the concession agreement for the financing, design, construction, operation and maintenance of a new power plant, named Atinkou - which means the house of light in Ebrié language - in the town of Jacqueville near Abidjan, in Côte d'Ivoire. The Atinkou power plant is similar to the one developed by Ciprel, a jewel of the Eranove group and a leading operator in power generation in Côte d'Ivoire. 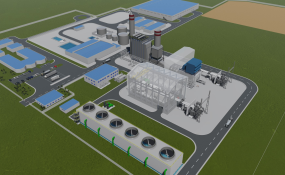 With an installed capacity of 390 MW, Atinkou - also known as Ciprel 5 in reference to the four units of this power plant operated since 1994 - will use the gas-steam "combined cycle" technology which increases energy efficiency. In addition,Atinkou will undertake a technological leap by introducing the first Class F gas turbines in Sub-Saharan Africa. These innovations will allow to produce more electricity without additional gas consumption. The cost of producing electrical energy is thus optimized and the environment is preserved by reducing CO2 emissions into the atmosphere. Locating the plant in Jacqueville also reflects the authorities' ambition to generate industrial activities outside the economic capital of Abidjan, in order to create jobs and better distribute the country's economic development geographically with the perspective of creating the Greater Abidjan. In fact, this Atinkou / Ciprel 5 project will provide 2,500 direct jobs during the construction phase and 100 direct jobs during the operation phase. "This power plant is part of the State's ambition to strengthen the country's electricity production capacity through new units operated by experienced private partners to enable Côte d'Ivoire to double its energy capacity to 4,000 MW by 2020 and to consolidate its position as an energy hub in the region," explains Mr Abdourahmane Cissé, Minister for Petroleum, Energy and Renewable Energies. This project will be based on the expertise and experience acquired by the Eranove Group, in particular through its subsidiary Ciprel. Created in 1994, Ciprel is the largest independent power producer (IPP) in West Africa and the largest in the WAEMU region. In February 2016, His Excellency Alassane Ouattara, President of the Republic of Côte d'Ivoire, inaugurated the fourth phase of the Ciprel power plant, co-powered by a new turbine and a combined cycle turbine, increasing the installed capacity from 321 to 556 megawatts (MW). With the Ciprel and Atinkou power plants, pan-African industrial group Eranove confirms its leadership position with nearly 1 GW of IPP production capacity, for a total of 1,640 MW including the seven hydroelectric and thermal power plants operated by the CIE.
"The rise of the Eranove Group both as an independent producer and as a delegated manager of public services in the water and electricity sectors reflects the solidity of our industrial capacities, which are characterized by our expertise in the combined cycle technology, the strength of our model based on African expertise and skills and the quality of our relations with the Côte d'Ivoire authorities, whom we would like to thank," stresses Marc Albérola, Managing Director of the Eranove Group. The Eranove Group is a leading player in utilities management and electricity and drinking water production in Africa. The Pan-African Industrial group has been present in Côte d’Ivoire for several decades (SODECI, CIE, CIPREL, Awale, and Smart Energy), in Senegal (SDE) since 1996, and in the Democratic Republic of Congo via a service contract with Régideso since 2012. The acceleration of the Eranove group's development (+44% revenue growth in five years) and its growing geographical footprint with projects under development in Gabon, Madagascar, Côte d'Ivoire, Mali and Togo confirm the appropriateness of its approach. With a turnover of 576 million euros, a power generation capacity of 1,250 MW, and 1,000 MW being developed, 437 million m3 of drinking water produced, Eranove Group employs more than 9,000 people, and catalyzes their skills and know-how to best serve its 1.9 million customers for electricity and 1.8 million for water (figures for 2017). As a responsible player, the Group is committed through its subsidiaries to all CSR (Corporate Social Responsibility) issues and to ISO 9001 quality, OHSAS 18001 safety and ISO 140001 environmental certifications. The majority shareholder of the Eranove Group is ECP (Emerging Capital Partners), a pan-African leader in private equity. ECP has raised more than $3 billion since its inception, making it one of the leading equity investors focused exclusively on Africa. ECP has six offices across Africa and more than 17 years of investment experience. The company has made more than 60 investments and 40 exits and operates in more than 40 countries on the continent.